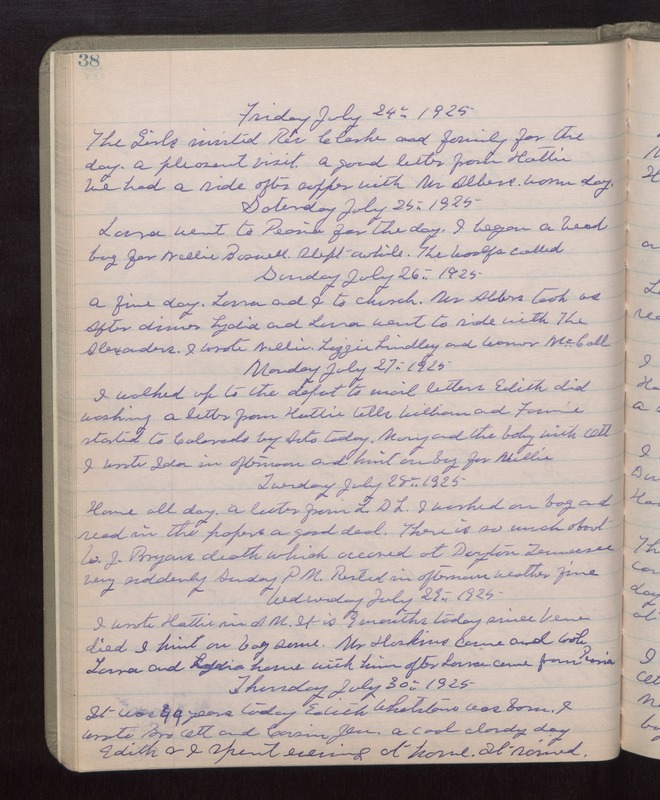 Friday July 24th 1925 The girls invited Rev Clarke and family for the day. A pleasant visit. A good letter from Hattie. We had a ride after supper with Mr Albers. warm day. Saturday July 25th 1925 Laura went to Peoria for the day. I began a bead bag for Nellie Boswell. Slept awhile. The Woolfs called. Sunday July 26th 1925 A fine day. Laura and I to church. Mr Albers took us. After dinner Lydia and Laura went to ride with The Alexanders. I wrote Nellie, Lizzie Lindley and Warner McCall. Monday July 27th 1925 I walked up to the depot to mail letters. Edith did washing. A letter from Hattie tells William and Fannie started to Colorado by Auto today. Mary and the baby with Ott. I wrote Ida in afternoon and knit on bag for Nellie. Tuesday July 28th 1925 Home all day. A letter from L D L. I worked on bag and read in the papers a good deal. There is so much about W. J. Bryans death which occurred at Dayton Tennessee very suddenly Sunday PM. Rested in afternoon. weather fine. Wednesday July 29th 1925 I wrote Hattie in AM. It is 9 months today since Vene died. I knit on bag some. Mr Haskins came and took Laura and Lydia home with him after Laura came from Peoria. Thursday July 30th 1925 It was 49 years today Edith Whetstone was born. I wrote Bro Ott and Cousin Jen. A cool cloudy day. Edith & I spent evening at home. It rained.